Solar cooker recipes, foods and the results. Complete dinner made with the sun! When my wife returned from the store with a roast, I knew we were going to have to try a nice solar-cooked roast for dinner! We decided to make it a full solar-cooked meal and began planning. This was the first time that we cooked an entire meal using only the sun! 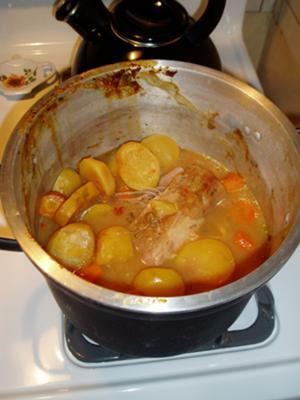 Along with the roast, we would cook some carrots and potatoes. We wanted dinner rolls to go with the meal and decided to round it out with some cinnamon cookies. We started working on the roast early. We first seared the roast to keep it juicy on our gas stove. Once it was seared, we added the carrots and potatoes along with the cream of mushroom soup and the onion soup mix. We put this into my cardboard solar cooker that is based on the “Heaven's Flame” plans by Joe Radabaugh as found at http://solarcooking.wikia.com/wiki/Heaven's_Flame. We loose the sun at 3:30 so I closed the reflectors over the top and left it till dinner. Two hours later, the internal temperature of the roast was still at 180 degrees Fahrenheit according to the meat thermometer. The roast cooked for a total of 6 hours. We also were able to make gravy from the juices and some corn starch. The next thing we put in to cook were the dinner rolls. 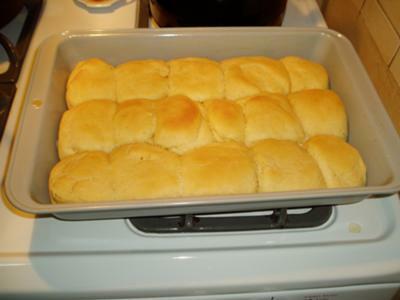 We use a recipe we found on Recipezaar (now food.com) that we like called “Country White Bread or Dinner Rolls”. This recipe is for a bread machine but I make the dough in a mixer. I heat the water in the microwave a little then add the yeast, sugar, salt, oil, egg and flour, in that order. Once it is mixed, I break it into 15 balls and put it into a greased 9x13 pan and let it rise for about 45 minutes. I then put it into my pre-heated solar box oven made from plans on the solar cooking wikia above for the “Minimum” Solar Box Cooker. The rolls stayed in the solar oven for about 3 hours, the first hour and a half by themselves and then with the cookies below for the remaining time. No meal is complete without dessert so we decided to make cinnamon cookies, another recipe we found on Recipezaar. The roast and rolls came out perfect and even though the cookies were hard, they sure tasted good! We'll definitely be cooking more meals using only the sun. This is exactly the way we like to have people share their solar cooking recipes, with all of the details. 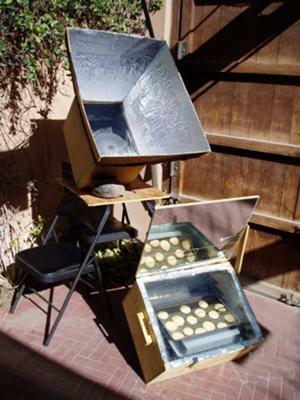 This should be very helpful to others who are also starting out or trying solar cooking.